We are located in Pensacola Beach Boardwalk all parking is a public lot. Pensacola Beach offers a Trolley that runs to all areas of the Island. We have entertainment during the season on Wednesday-Sunday. All entertainment will depend on events that are scheduled that day. Please call for any information regarding entertainment. We offer a variety of different event options. You can call are Event Coordinator directly to receive information regarding all catering and banquet options. Hemingway’s Island Grill offers casual dockside dining overlooking the beautiful Santa Rosa Sound. Our award winning restaurant features a diverse menu of fresh seafood, sultry steaks, succulent poultry, and much more. crispy calamari drizzled with honey chipotle glaze served with our homemade caribbean dipping sauce. fresh thin-sliced onions, hand-breaded and deep-fried, served with our key lime mustard sauce. coconut coated shrimp drizzled and served with key lime mustard with a pineapple-orange dipping sauce. six jumbo shrimp grilled and brushed with hemingway's dark rum sauce served with island salsa and garlic bread. a flour tortilla stuffed with marinated grilled chicken, tomatoes, red onion and pepper jack cheese topped with fresh salsa and island pepper sauce. a half pound of beer-boiled shrimp served with sides of our hemingway's key west jerk barbecue sauce and spicy cocktail sauce. a half dozen large wings tossed in our hemingway's key west jerk barbecue sauce. lobster claw meat in a thick creamy blend of island spices, butter, sherry and cream. tender black beans and seasoned beef topped with tomato, scallions and monterey jack cheese. tender conch, spicy tomato broth, potatoes, onions and peppers. crisp romaine with reggiano parmesan cheese, tossed with a coconut-pineapple caesar dressing and garlic croutons. fresh greens, cucumbers, carrots, red onion and tomatoes tossed with balsamic vinaigrette. grilled rum-glazed salmon, served on a bed of baby spinach, with chipotle-lime vinaigrette, bacon crumbles, feta cheese and strawberries. fresh mozzarella, vine-ripe tomatoes, mixed greens and marinated red onions topped with blackened chicken and a balsamic vinaigrette. marinated skirt steak served on a bed of mixed greens tossed in a balsamic vinaigrette with roasted portobello mushrooms, crumbled bleu cheese and roma tomatoes. sautéed shrimp. roma tomatoes, onions, garlic, key lime juice and cilantro tossed with linguini. citrus marinated grilled chicken breast tossed with red bell peppers, butter, cream, reggiano parmesan cheese, and fettuccine. cheese stuffed tortellini tossed in alfredo sauce and placed atop marinara sauce with a choice of citrus marinated grilled chicken breast or 5 grilled shrimp. fresh cilantro basil pesto, and four cheese blend. roma tomatoes, and fresh cilantro basil pesto with four cheese blend. topped with five cheeses green onions and hemingway's sweet and tangy jerk barbeque sauce. char-grilled fish selection topped with a spinach artichoke sauce and feta cheese over garlic smashed potatoes. 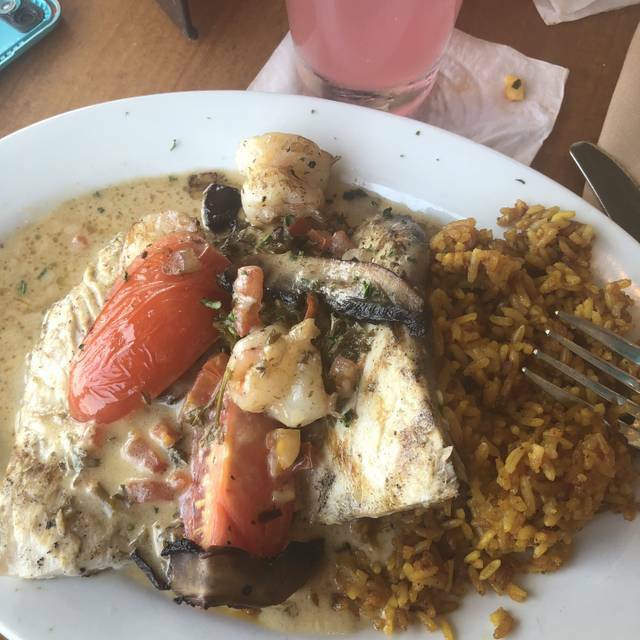 char-grilled fish selection topped with sautéed shrimp, onions, tomatoes, mushrooms with a creamy citrus butter sauce over island rice. chargrilled fish selection topped with lump crabmeat and asparagus spears, drizzled with hollandaise sauce served over island rice. marinated skirt steak served with caramelized onions and garlic smashed potatoes. 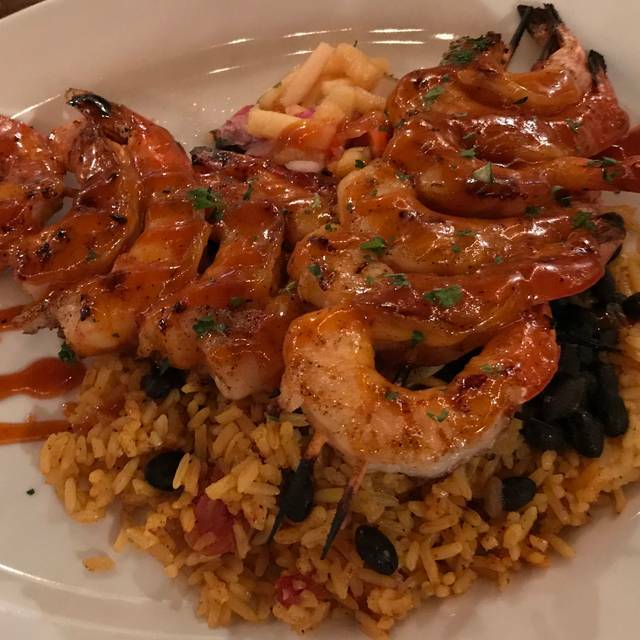 12 large grilled shrimp brushed with hemingway's dark rum sauce and served with island salsa, yellow rice and black beans. our aged filet medallions rubbed with roasted garlic and island spices, grilled to perfection, topped with a citrus butter sauce and served with garlic smashed potatoes. tilapia, bay scallops and jumbo shrimp fried crisp on the outside and tender in the middle served with crispy fries, spicy cocktail sauce and tartar sauce. sweet plantains with vanilla rum dipping sauce. fresh idaho potatoes smashed with garlic, cream and butter. black beans with beef on hemingway's island rice with a dallop of sour cream and red onion. spaghetti squash, fresh garlic, butter, cracked pepper and nutmeg. cuban black beans simmered in island spices with garlic and onion. grilled asparagus seasoned with garlic and olive oil, topped with feta cheese. green beans, bacon, onion, and garlic. a side portion of our fresh thin-sliced onions, hand-breaded and deep-fried, served with our key lime mustard sauce. served with a pile of seasoned french fries. a half-pound of choice ground beef, hand-pressed and chargrilled with sharp cheddar cheese, topped with lettuce, tomato and red onion. citrus marinated chicken breast grilled served on a kaiser roll with lettuce, tomato and onion with a side of island pepper sauce. caribbean spiced fish filet grilled, fried or blackened with lettuce, tomato and onion on a fresh toasted kaiser roll. sliced cuban roast pork and ham with swiss cheese and dill pickle, topped with whole-grain mustard and mayonnaise on pressed cuban bread. thin-sliced smoked turkey and jalapeno jack cheese with sun-dried tomato pesto on pressed cuban bread. golden fried shrimp with fries. grilled cheese sandwich with fries. linguini with marinara sauce and garlic bread. grilled or fried tilapia served with island rice. Free glass of house wine with the purchase of a Fresh Catch Fish Entree! Enjoy a complimentary glass of house wine (Cabernet Sauvignon, Merlot, Pinot Grigio, or Chardonnay) when you order one of our Fresh Catch Fish Entrees! 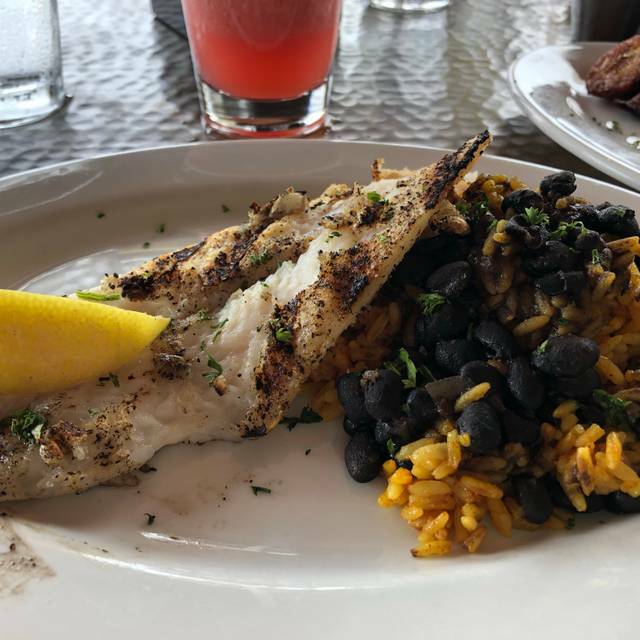 Fish selections* include Snapper, Grouper, Mahi-Mahi, Trigger, Salmon, and Tuna and are served with our House Made Island Yellow Rice and Garlic Steamed Broccoli. *Fish selections may change based upon availability. 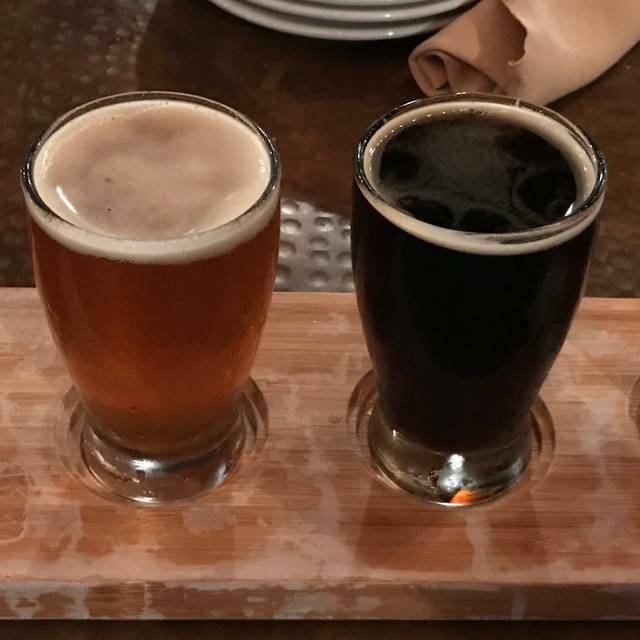 We carry 13 beers on tap ranging from known national names to many smaller breweries here in the Gulf Coast! Please enjoy $2 off any of our 16oz draft beers. Have some complimentary muffins with your brunch items! Enjoy our variety of muffins on the house when you purchase any brunch item. Try anything from the Huevos Rancheros to our Steak & Eggs! Come enjoy one of our hand crafted Mojitos for only $4 on Wednesdays from 4pm-8pm! Made with limes, mint, pure cane syrup, soda water and plenty of rum! 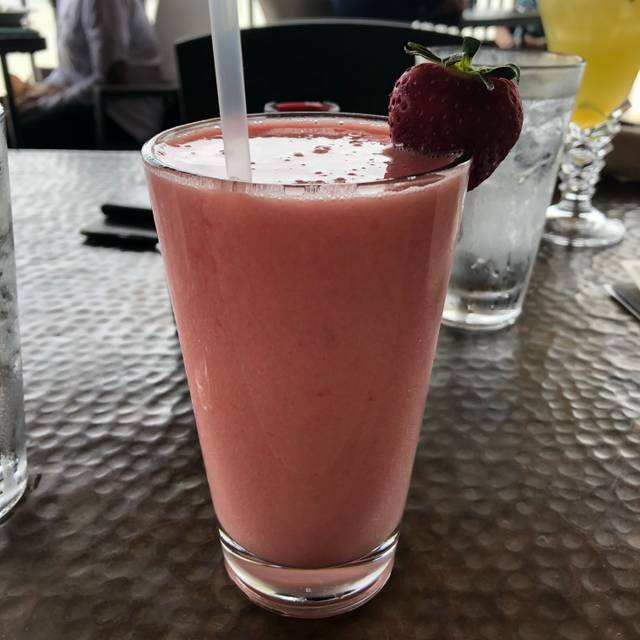 All you can drink mimosas for $8 here at Hemingway's Island Grill! 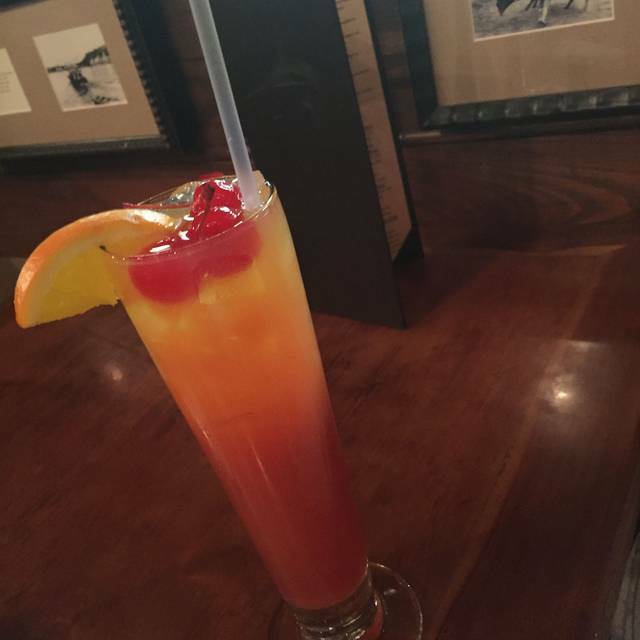 Please enjoy 30% off bottles of wine, all day Thursdays, here at Hemingway's Island Grill. Not a great selection of local fish. Would recommend elsewhere if your looking for seafood. It was another outstanding meal at Hemingway’s! We were dining with friends we had not seen in a while and wanted to go somewhere special. Hemingway’s never disappoints. I love the Snapper ole, which is perfect every time. My husband loves the Longboat Mahi, and our friends had Snapper Ole and Salmon St. Croix. All were impressed! We finished with delicious bread pudding. Our server was the best, but I don’t remember her name. We highly recommend this place. It’s very special to us! Excellent restaurant. The food, the service and the views were all excellent. My husband and I both had their conch chowder and fresh fish with their Oscar sauce (lump crab meat, asparagus, and hollandaise) and loved it. 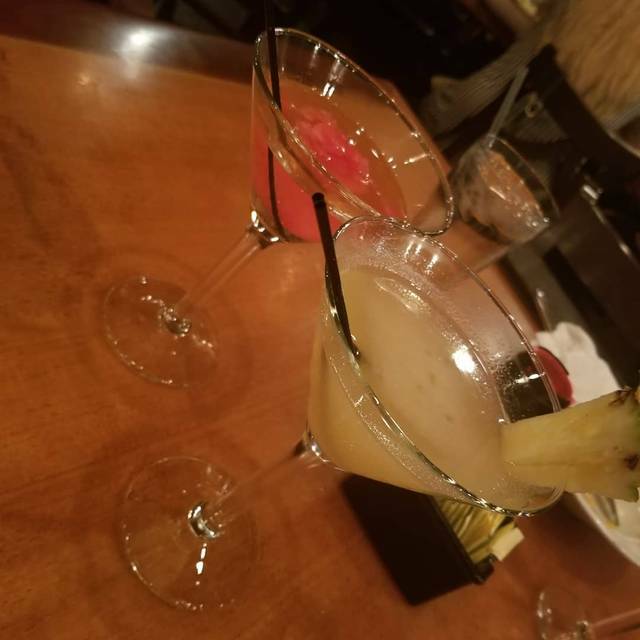 Drinks were great as well. And the prices very reasonable. Highly recommend ! FOOD AND ATMOSPHERE WAS AMAZING FOR MY WEDDING REHEARSAL DINNER. GREAT PRICES FOR SUCH AN ELEGANT AND RELAXING PLACE!! IM SUPER EXCITED FOR MY JUNE WEDDING 2019 THERE!! Out of the six people in our party, only two were satisfied with their meal. Three of us ordered filet mignon, oscar style, only one actually got a filet. The other two got sirloin instead. There was a live band playing at the time which made conversation very difficult. Overall we were not happy with our meal. I would not recommend Hemingway's nor would I go back the next time we are in Pensacola. Food was excellent, as well as the service with a great view. Food was amazing! Fresh fish daily. Megan was very knowledgeable, friendly, helpful. For my wife’s birthday party we picked him in Waze because we had never been there before and we are locals the service was outstanding and the food was outstanding as well we will bring our party back again! 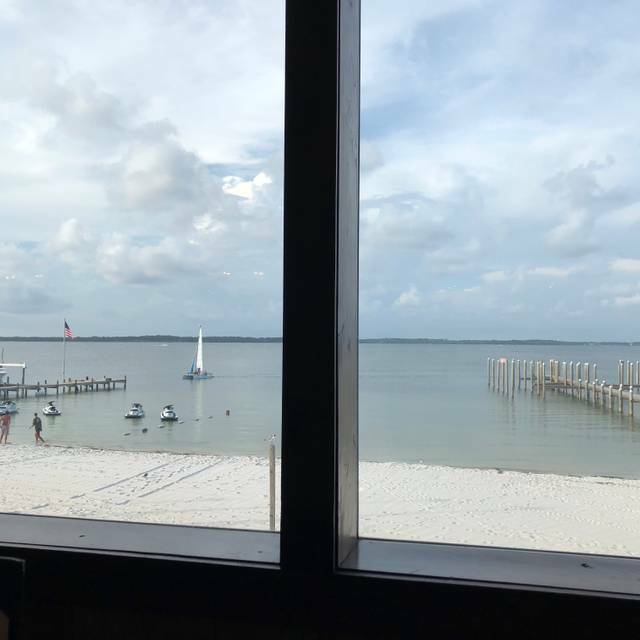 We loved the view of the beach as we were seated right next to a window. It was rather quiet since we were dining very early, but since the servers were not busy yet they were carrying on amongst themselves somewhat (not our server). The food was very good..especially the fillet mignon. The menu choices were varied and interesting. The quality of ingredients were excellent. Service was timed perfectly. I will say the wine choices were rather limited though, maybe a few more European and South American choices would’ve been nice. We really enjoyed the beach front table and the wedding ceremony that we got to witness made it extra special. We love it and go there every time we are in Pensacola Beach. The Key Lime Pie is unbelievable, so yummy. I wish we could get it up here in Atlanta. Great place with great food - always a good choice for dinner. First time back to Hemingway’s in a while-previous experience was very good-talked it up to friends who were with us but...Food was just average-ordered a Cuban (thinking Hemingway ) and got disappointing sandwich that looked like it came from c-store-need to learn how to make a “real” Cuban ! The only bright spot was our server-she did a great job! Probably won’t return anytime soon if at all-too many other options! Food was not worth $$$ as advertised and did not compare in taste to others in the area with same pricing. Awesome!!! Food was delicious!! Service was great! Good, always fresh, seafood in a very comfortable environment. A really loud band when we were there, but seating on the veranda is pretty quiet and with nice views of the lagoon. Had 2 issues with our order. My husband had a hair in his salmon which he found when he took his first bite. He told the waitress and she had his meal remade but implied quite strongly that he put it there himself. The second way steak was ordered medium and it came out rare. We paid way to much to get poor service and just ok food. Amazing as always! Anytime we make a trip to Pcola Beach, Hemingway's is a MUST! We had a group of 6 and maybe it would have been better with fewer people. The food came out warm not hot. The server was given a 100 bill by our friends and was shorted 19.00 in change - his attention was brought to it and corrected himself. He also "accidentally put my credit card in his pocket" and brought it back to me. Great food and a good view outside! Definitely great value and perfect for a date night! The staff was super accommodating with our very large party on a very busy Saturday night. We really appreciated their flexibility. All food was good and came out together for 26 people. Forgot that it was sori g break at Pensacola beach when we made these reservations. No valet service and parking was a challenge. The food was good and Alex our server did a great job. Hemingway's was beautiful, delicious, and a wonderful place to go for lunch, drinks, or dinner. Overall, the experience was fine. At the top of my list is the service. Our server was attentive, patient when necessary and efficient in all areas. My main entree was fine. I enjoyed the flavors of the blackened red snapper. Lowest in my list is the spinach crab dip. It tasted quite bland and fishy. My favorite restruant on the Island. Fish is super fresh and sauces are execellent. Service was also excellent. Food was just OK. I had the rib eye steak, the second most expensive item on the menu. The potatoes were very good, as were the onion strips. 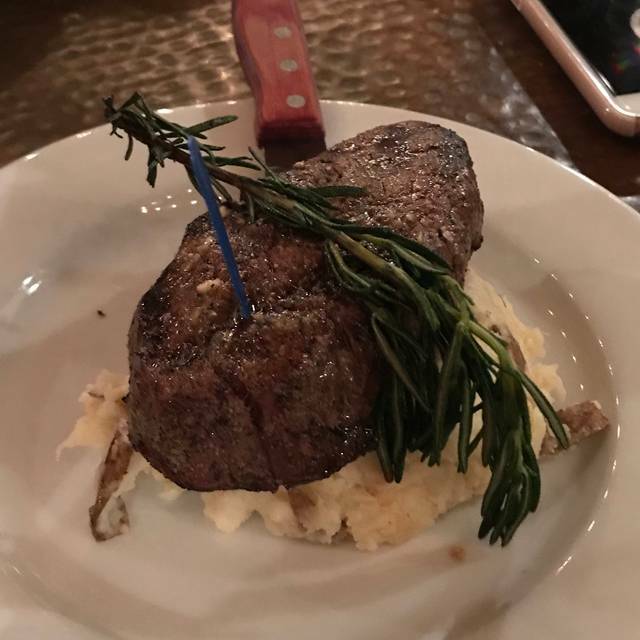 However, the steak was VERY fatty, and while I ordered it medium rare, it was just raw in general. Last minute get together with family and friends. No wait, great food and attentive service. Good food! Great service! I would recommend this Pensacola restaurant. Food was delicious, but overpriced. Charged extra for everything. Even the birthday brownie that we were told was free ended up being 6.99. I pointed it out to the waitress, who was the one that told us we could pick one of 3 desserts for free for the birthday boy. She said she was sorry, that she was new, but did not offer to try and correct the issue. We also had to ask for drink refills twice. Not what I expected. This was our favorite restaurant in our weeks vacation in Pensacola. It’s beautiful, stylish and clean with delicious food, friendly staff and live music enhanced by beautiful views. Good atmosphere and ocean view. Food and service was very good. Waitress was very good and mindful of our needs. Would definitely come back. What a missed opportunity. This restaurant has a great location and beautiful view, but the food is lacking and uninspired. What should be a high quality restaurant comes off as an upscale tourist trap. It never fails us. Will miss it when we return to Iowa.